So what is CliffCare? The Victorian Climbing Club was formed in 1952 and incorporated in 1985. The aim of the club is to promote the sport of climbing. The Victorian CliffCare Trust was set up in 1998, is administered by the VCC, and in simple terms is the environmental arm of the club. CliffCare is dependant on donations and grants in order to undertake access negotiations and environmental projects to protect and repair the places where you love to climb. Hundreds of climbers have joined in our practical repairs of the cliff environment in Victoria. 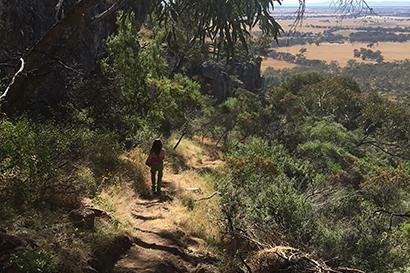 You can see our work at Pharos Gully Track, Central Gully Track, Bushranger’s Bluff and Organ Pipes at Mt Arapiles, Summer Day Valley, Mt Rosea climbers track in the Grampians National Park, Camels Hump, Werribee Gorge and Black Hill. Climbers have also been involved in track repair, clearing and revegetation projects following numerous fires and floods in many of the parks where climbing occurs.